Monitoring solutions leverage services in Azure to provide additional insight into the operation of a particular application or service. This article provides a brief overview of monitoring solutions in Azure and details on using and installing them. Monitoring solutions were previously referred to as management solutions. Monitoring solutions typically collect log data and provide queries and views to analyze collected data. They may also leverage other services such as Azure Automation to perform actions related to the application or service. 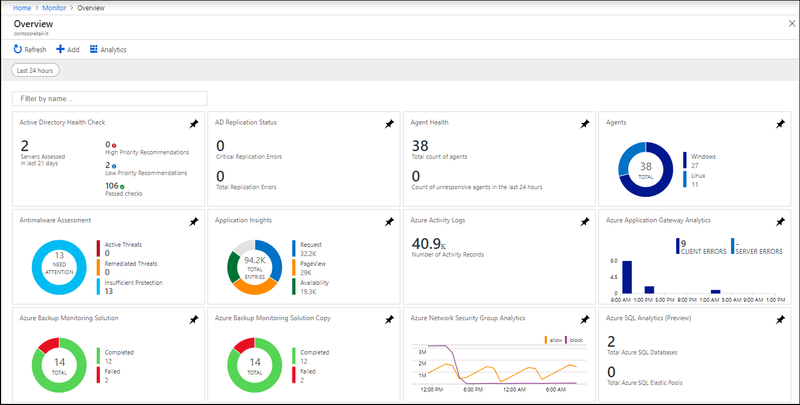 You can add monitoring solutions to Azure Monitor for any applications and services that you use. They are typically available at no cost but collect data that could invoke usage charges. In addition to solutions provided by Microsoft, partners and customers can create management solutions to be used in their own environment or made available to customers through the community. 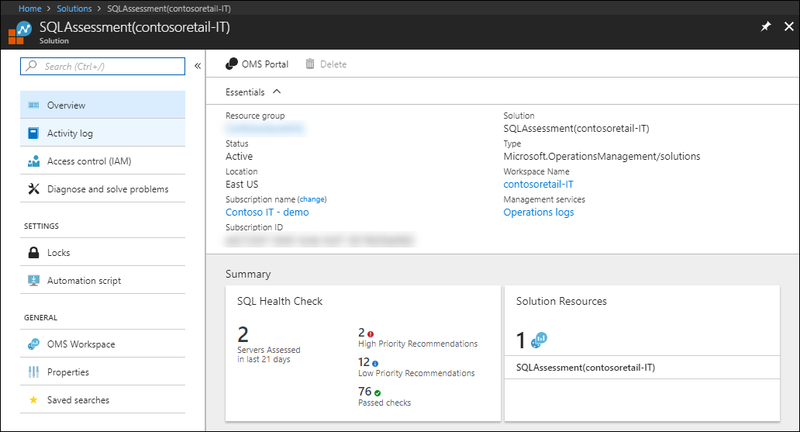 Open the Overview page in Azure Monitor to display a tile for each solution installed in the workspace. Open All services and locate Monitor. Under the Insights menu, select More. Use the dropdown boxes at the top of the screen to change the workspace or the time range used for the tiles. Click on the tile for a solution to open its view which includes more detailed analysis its collected data. Monitoring solutions can contain multiple types of Azure resources, and you can view any resources included with a solution just like any other resource. For example, any log queries included in the solution are listed under Solution Queries in Query explorer You can use those queries when performing ad hoc analysis with log queries. Use the following procedure to list the monitoring solutions installed in your subscription. Open All services and locate Solutions. Solutions installed in all your workspaces are listed. The name of the solution is followed by the name of the workspace it's installed in. Use the dropdown boxes at the top of the screen to filter by subscription or resource group. Click on the name of a solution to open its summary page. This page displays any views included in the solution and provides different options for the solution itself and its workspace. View the summary page for a solution by using one of the procedures above to list solutions and then click on the name of the solution. Monitoring solutions from Microsoft and partners are available from the Azure Marketplace. You can search available solutions and install them using the following procedure. When you install a solution, you must select a Log Analytics workspace where the solution will be installed and where its data will be collected. From the list of solutions for your subscription, click Add. To the right of Management Solutions, click More. Locate the monitoring solution you want and read through its description. Click Create to start the installation process. When the installation process starts, you're prompted to provide required configuration which varies for each solution. Members of the community can submit management solutions to Azure Quickstart Templates. You can install these solutions directly or download them templates for later installation. Follow the process described in Log Analytics workspace and Automation account to link a workspace and account. Go to Azure Quickstart Templates. Search for a solution that you're interested in. Select the solution from the results to view its details. You're prompted to provide information such as the resource group and location in addition to values for any parameters in the solution. Click Purchase to install the solution. All monitoring solutions require a Log Analytics workspace to store data collected by the solution and to host its log searches and views. Some solutions also require an Automation account to contain runbooks and related resources. The workspace and account must meet the following requirements. Each installation of a solution can only use one Log Analytics workspace and one Automation account. You can install the solution separately into multiple workspaces. If a solution requires an Automation account, then the Log Analytics workspace and Automation account must be linked to one another. A Log Analytics workspace may only be linked to one Automation account, and an Automation account may only be linked to one Log Analytics workspace. To be linked, the Log Analytics workspace and Automation account must be in the same resource group and region. The exception is a workspace in East US region and Automation account in East US 2. How you specify the Log Analytics workspace and Automation account depends on the installation method for your solution. 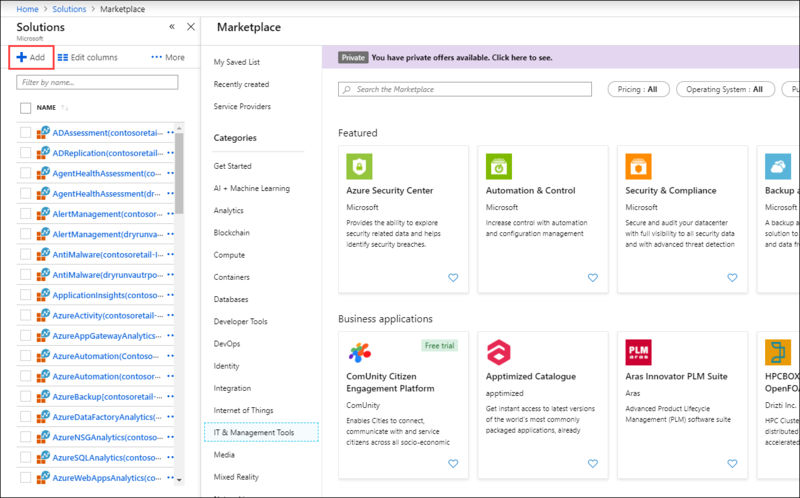 When you install a solution through the Azure Marketplace, you are prompted for a workspace and Automation account. The link between them is created if they aren't already linked. For solutions outside of the Azure Marketplace, you must link the Log Analytics workspace and Automation account before installing the solution. You can do this by selecting any solution in the Azure Marketplace and selecting the Log Analytics workspace and Automation account. You don't have to actually install the solution because the link is created as soon as the Log Analytics workspace and Automation account are selected. Once the link is created, then you can use that Log Analytics workspace and Automation account for any solution. You can verify the link between a Log Analytics workspace and an Automation account using the following procedure. Select the Automation account in the Azure portal. Scroll to the Related Resources section of the menu. If the Workspace setting is enabled, then this account is linked to a Log Analytics workspace. You can click on Workspace to view the details of the workspace. To remove an installed solution, locate it in the list of installed solutions. Click on the name of the solution to open its summary page and then click on Delete. Get a list of monitoring solutions from Microsoft. Learn how to create queries to analyze data collected by monitoring solutions.